These delightful, individual brownies taste like a thick and rich peanut butter cup! Preheat oven to 350°. Grease muffin tins with nonstick cooking spray. Combine peanut butter and butter with hand mixer until smooth. Add powdered sugar and continue mixing until well incorporated. Mixture should be thick and resemble cookie dough. Cover and refrigerate until ready to use. Combine ingredients for brownie mix following package instructions for cake-like brownies. Fill each muffin cup with 1 level tablespoon of batter. Recipe will make about 45 brownies. Bake 8-10 minutes or until toothpick comes out clean. Let brownies cool completely, and then gently remove from muffin tin. For topping, melt shortening in a saucepan over low heat. Add chocolate chips and stir until melted and smooth. Let mixture cool for 5 minutes. To assemble, scoop 1 tablespoon of peanut butter mixture into palm, roll into a ball, then flatten. Set one disc on top of each brownie, then use palm to gently press flat. Spoon 1 tablespoon of chocolate evenly on top, completely covering the peanut butter mixture. 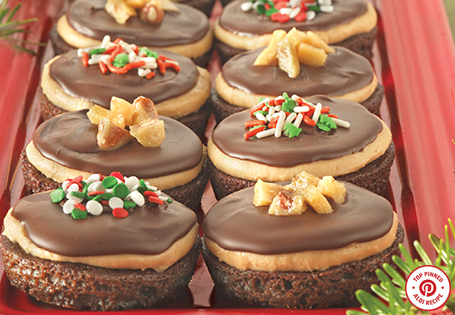 If desired, immediately top unset chocolate with candy pieces for a festive garnish. Let brownies sit for 30 minutes at room temperature or refrigerate for 10 minutes to set chocolate.